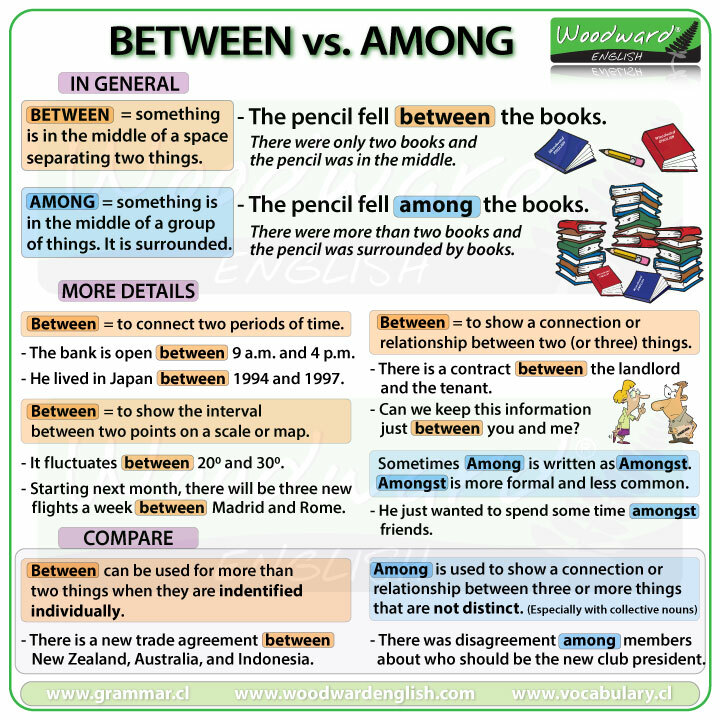 Between and Among are prepositions. BETWEEN, as a preposition of place, is used to say something (or someone) is in the middle of a space separating two things. Chile is on one side. Argentina is on the other side. The mountains are in the middle. The lady is standing between the two sunflowers. There is a large sunflower on both sides of the lady. AMONG is used to say that something (or someone) is in the middle of something or a group of things. It is surrounded by something or is a part of a group. She swam among dolphins while in New Zealand. We can use BETWEEN to connect two periods of time. The bank is open between 9 a.m. and 4 p.m. I lived in Japan between 1994 and 1997. NOTE: We cannot use Among with periods of time. We can also use BETWEEN to show the interval between two points on a scale or a map. We are looking for an actor between 35 and 45 for a TV commercial. The temperature fluctuates between 20 and 30 degrees. Starting next month, there will be three new flights a week between Madrid and Rome. BETWEEN can be used to show a connection or relationship between two (or three) things. There is a contract between the landlord and the tenant. Can we keep this information just between you and me? What is the difference between DO and MAKE in English? BETWEEN can sometimes be used for more than two things when those three or more things are individually identified. There is a new trade agreement between New Zealand, Australia, and Japan. The prize money was divided between Paul, Daniel, and Mike. (You can also use among in this case). You have to choose between the blue one, the green one, or the red one. AMONG is used to show a connection or relationship between three or more things that are not distinct, especially when considering a collective relationship. This is commonly used with group nouns or mass nouns. There was disagreement among members about who should be the new club president. Panic spread among the students when they discovered that they were about to have a surprise test. Among those in the audience was the actress Suzy Star. Sometimes you will see Among written as Amongst. Amongst is more formal and less common. She just wanted to spend some time among friends. There was an agreement between the University of Auckland, Waikato University, and Lincoln University. Here we are specifying the universities. Remember, it is possible to use the preposition BETWEEN with more than two things when they are identified individually. In this example we have specifically identified the universities with their names. There was an exchange agreement among the universities. Here we are not specifying which universities.